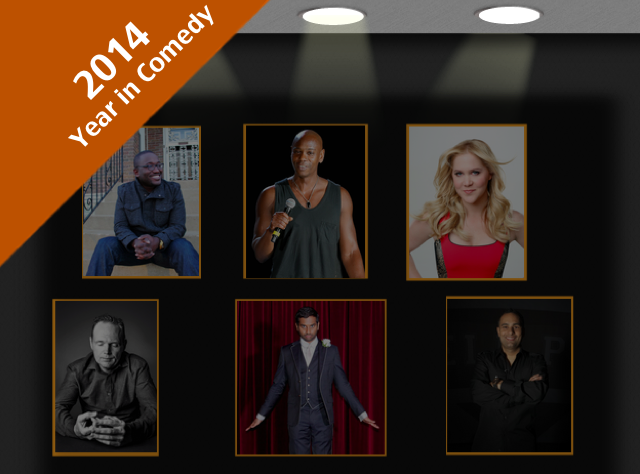 You may have heard that 2014 was the greatest year in comedy, in the history of all years in comedy. And it’s true, 2014 was a giant year for comedy. Giant tours, huge specials, incredible albums, and more than a few great books. But who had the biggest year of 2014? Who had the year everyone else wanted? We’re letting you decide. We did the hard work. We narrowed it down to six greats. All you have to do is vote for your favorite. Leave us a comment letting us know who you picked and why they deserve to win. If you send in the best answer, you could win a copy of Scrooged, signed by the entire main cast plus, screenwriter Mitch Glazer! Start voting, leave a comment and good luck to the six. Scroll past the graphic to vote. Hannibal Buress. You couldn’t have a more talked about year in comedy than Hannibal Buress did. After debuting his second comedy special ‘Live In Chicago’ to critical acclaim, Buress became the name everyone brought up when discussing the best comics on the rise today. Buress appeared in every comedic medium this year with a role in the hit film ‘Neighbors’ and as the sidekick on the ‘Eric Andre Show’ on Adult Swim. Buress changed the face of comedy this year, when a video of his stand up act, changed the way the world sees Bill Cosby. Ending 2014 with the much talked about ‘Comedy Camisado Tour’ is the perfect way to wrap the year for Buress, who was the talk of comedy in 2014. Amy Schumer. Amy Schumer’s stock was rising going into 2014 and she had a stellar year. The second season of her show ‘Inside Amy Schumer’ was even better than the first season and showed how a comedy can be silly and vulgar while being incredibly poignant at the same time. Schumer’s ability to comment on social issues and taboo topics in a relatable and funny way were the reason her show was nominated for an Emmy and picked up for another season. Schumer continued to perform stand-up regularly while filming her new movie that she wrote and stars in, and Judd Apatow is directing, and there is a ton of buzz about the project. And lets not forget she killed it at Carnegie Hall during the New York Comedy Festival. Schumer proved that when it comes to comedy, there’s nothing she can’t do. Bill Burr. It seems like every comedian wants to be Bill Burr, and have his career. He’s the name that always comes up in conversations about the best names in the business. Comedically, Bill Burr funnier than ever, with his newest special ‘I’m Sorry You Feel That Way’ premiering to great reviews. Burr’s recent acting credits have brought him to the attention of people not as familiar with his act, but fans of Burr have known he was capable of rising to the top of comedy for years. He also locked down his own television show on FX, and right now seems unstoppable. Russell Peters. Russell Peters is arguably the biggest comedian in the world but has somehow flown under the radar. This changed in 2014 as he helped bring back stand-up to prime time as he appeared as a judge on the newest season of ‘Last Comic Standing’. Peters continued to play some of the biggest venues in the world, culminating in a sold out show at Madison Square Garden, a feat accomplished by only a handfull of names. He may the called the “hit comedian you never heard of” but he’s still at the top of the game. Aziz Ansari. Aziz Ansari’s rise in comedy has been a very fast one, and 2014 saw him reach a pinnacle, with two sold out shows at Madison Square Garden. While wrapping up his lovable role as Tom Haverford on ‘Parks & Recreation’, Ansari also managed to release his third stand-up special while being honored with Variety’s ‘Power of Comedy’ award. 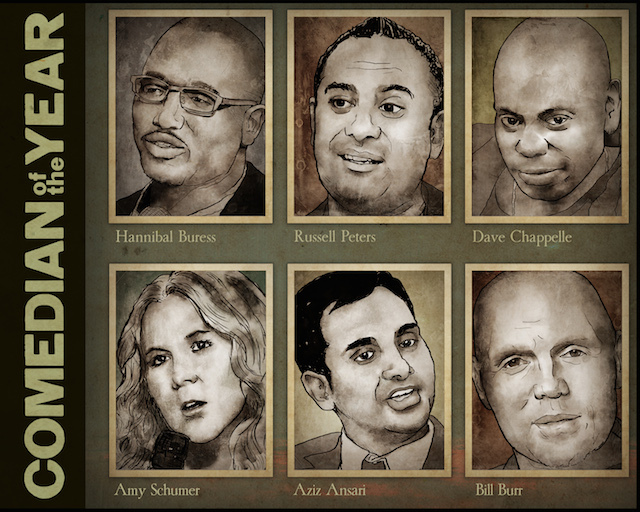 Not many comics can hold the honor of playing the Garden, and Ansari can add his name alongside the comedy legends who have.